Woody Allen makes no secret of the famous literary work most influential in the writing of his screenplay for Irrational Man (2015). Dostoyevsky’s Crime and Punishment is sighted and cited in this enjoyably tension-free drama of a philosophy professor filled to the brim with ideas but no longer a zest for life itself. Trapped in a vault of dark contemplation from which even his physical comfort in liberal sexual relations has been short-circuited by his malaise of despair, Abe (Joaquin Phoenix), enters a new university – with each fresh residency his reputation precedes him with even loftier notions of – and the circuit of a curious student, Jill (Emma Stone), who quickly becomes unhealthily obsessed with him. An unquenchable thirst for knowledge and experience – in direct contrast to that provided by her squeaky clean boyfriend Roy (Jamie Blackley) who wears her gifted sweater as a badge of honour and wholesomeness – soon turns to romantic delusions of her compatibility to Abe. This is further reinforced the deeper she probes, uncovering a circuitous torture of dissatisfaction and apathy that she’d love to correct with the alluring distractions of her youthful presence. In the spirit of Dostoyevsky’s classic however, it’s contemplation of the murder of a life that contributes nothing useful to the world that kick-starts the fire in Abe’s belly. Suddenly he becomes enamoured with life’s renewed possibilities, the thought of eliminating a negative force for the betterment of the world, in this case a pitiless judge whose prejudicial behaviour has ruined the life of a mother seeking fair play in retaining custody of her children. Abe is alerted to the judge’s existence by an overheard conversation in a diner and the path is set for a perfect crime to be plotted and executed. All sorts of moral boundaries are examined and cross-examined and if Allen’s digressions are camouflaged in blackly humorous asides, there’s enough seriousness here to provoke thought as the crime exposes, as it inevitably must do, a series of playfully dangerous options for the cocky, renewed Abe. Will he confess in the manor of Dostoyevsky’s tortured Raskolnikov? Will the sly dispatching of the judge be the beginning of a murderous spree that strengthens him physically and restore his mental balance? Or will his new found expression of joy for living be only momentary as he’s undone by hubris like countless perpetrators before him? 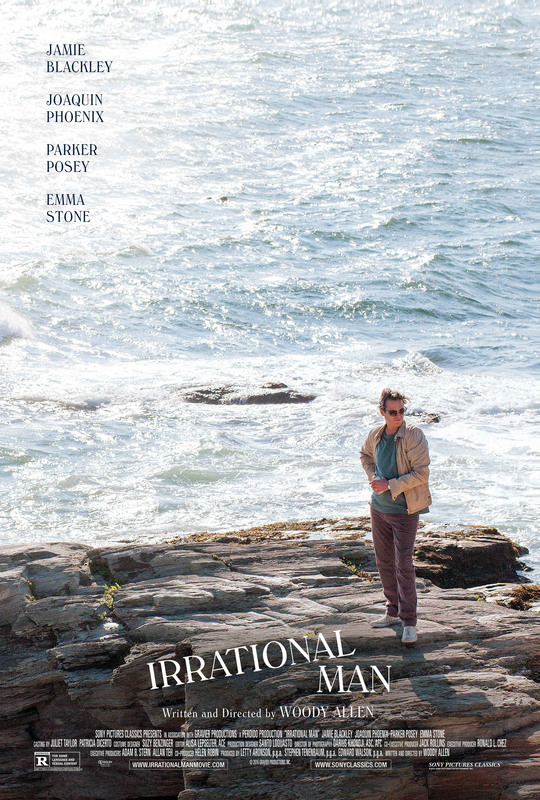 With its hilariously tasty final twist, Irrational Man stands as a strong addition to Allen’s filmography. Though it’s not in the same class as his recent creative high points, Midnight in Paris (2011) and Blue Jasmine (2013), it does straddle a too rarely inhabited middle ground of quality, in so doing helping to erase memories of the director’s recent diabolical flops like You Will Meet a Tall Dark Stranger (2010) and the especially awful When in Rome (2012). As usual, Allen’s casting is spot on, with Phoenix in fine form as the unhurried, laid-back Abe whose apathy seems to be more characteristic of the actor’s process with his very idiosyncratic line-recitations. Few performers, it seems, are capable of providing such a strange but utterly compelling mix of inward-gazing intensity with a cheerless playfulness that only reinforces the inscrutability around his character. The sparky Stone holds her own and even if her performance doesn’t require her to stretch in the way Alejandro Gonzalez Innaritu asked her to in Birdman (2014), there’s nothing left hanging in her credible portrayal of the smitten Jill. Parker Posey has a juicy role as a fellow faculty member who unsubtly attempts to bed Abe from the moment he arrives to escape her own failing marriage, whilst the rest of the supporting players form a steady wall of secondary support.